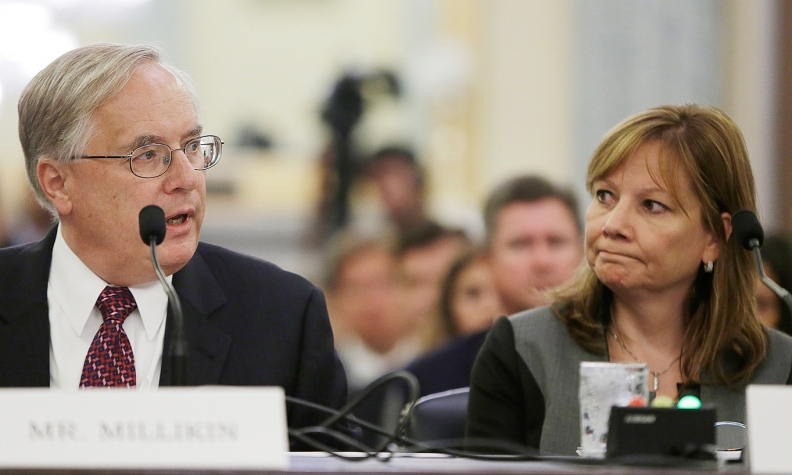 Millikin, left, and GM CEO Mary Barra, right, faced blistering hearings before Congress on the company's delayed recalls. DETROIT -- General Motors' top lawyer Michael Millikin is retiring three months after he withstood withering criticism by lawmakers for his department's handling of GM's deadly ignition switch defect. GM said today that Millikin, 66, informed the company of his decision to retire early next year. GM will begin an immediate external search for his replacement, the company said in a statement. During a Senate hearing in July on GM's handling of its recall of 2.6 million cars for a faulty ignition switch linked to 27 deaths, senators questioned how Millikin couldn't have known about the defect when top lawyers had worked on the matter for years. In a statement, GM CEO Mary Barra -- who defended Millikin during the hearings -- praised the 66-year-old's leadership. “He has led global legal teams through incredibly complex transactions, been a trusted and respected confidant to senior management, and even led the company’s global business response team following the tragedy of 9/11," Barra said. Barra added that Millikin has been helpful to the CEO personally, and called him "a man of impeccable integrity, respectful candor, and unwavering loyalty." Millikin is the third GM executive with a connection to the ignition switch issue to retire this year. Jim Federico, a top engineer who oversaw an internal inquiry into the problem several years ago, retired in May to take a job as vice president of Harley Davidson. GM’s global engineering chief, John Calabrese, announced his retirement in April as Barra unveiled a restructuring of his department that included splitting his job into two separate roles. Documents show that Calabrese was aware of GM’s investigation into the matter in recent years, and he was one of three executives charged with deciding when to issue a recall. GM said the earlier retirements were not related to the recall. Federico and Calabrese are each about 10 years younger than Millikin. Millikin joined GM in 1977 after a short stint as a federal prosecutor on drug cases. He was named chief counsel in July 2009, five days after GM emerged from bankruptcy. The investigation by outside attorney Anton Valukas found that Millikin's attorneys worked on cases involving the ignition switch for years, including authorization of a $5 million settlement with a crash victim several months before GM issued a recall. Millikin and Barra told lawmakers that they weren't notified of the issue until after GM authorized the recall in late January. At least five employees from his department were fired in June for their handling of the ignition switch defect. Two were high-level lawyers who reported directly to Lucy Clark Dougherty, GM's chief counsel for North America and a close Millikin confidant, insiders have said. GM said Millikin will stay on the job until the transition of the new general counsel is complete. GM declined to make Millikin available to comment, and he could not be reached. One critic believed Millikin may have been pressured by the company to retire. "Millikin is under the microscope for his failures and his allowing GM to face potential criminal prosecution as a result of the ignition switch cover-up," said Robert Hilliard, a lead attorney for plaintiffs suing GM over the faulty switch. "Certainly GM doesn't think that anyone believes this a really a voluntary 'retirement,'" he said. "It is an attempt by GM to distance itself from a potential target of a criminal probe." GM spokesman Patrick Morrissey said Millikin was not forced out, and, in the past, had even been asked to stay on longer by Barra and the board. He declined to comment on any criminal investigation. State and federal prosecutors are investigating GM for issues related to the faulty switch. It is not clear whether prosecutors are developing any cases against individuals, as their main focus has been on building a straightforward mail and wire fraud case against GM, sources told Reuters in June. As part of their attempt to build a case against the company, sources said in August that prosecutors are looking at whether lawyers who attended key meetings about GM's switch problems acted appropriately after the meetings or whether they mishandled information discussed. Millikin's legal department came in for heavy criticism in the 325-page report by Valukas released by GM in June. The report said Millikin did not know details of the ignition switch problem until this year. GM said in March the internal investigation into the circumstances relating to the ignition-switch recall would be led by Valukas, chairman of Chicago-based law firm Jenner & Block. Millikin was named co-leader of that investigation. Questions were raised at the time about the law firm's relationship with the automaker. GM has worked with Jenner & Block since 2002, and at least two of the automaker's former top attorneys were partners at the Chicago law firm. When Barra and Millikin were questioned at a U.S. Senate hearing in mid-July, lawmakers demanded to know why Millikin was not fired. "I do not understand how the general counsel for a litigation department that had this massive failure of responsibility, how he would be allowed to continue in that important leadership role," U.S. Sen. Claire McCaskill, D-Mo., said then. She described the failure of GM's legal department as "stunning." U.S. Sen. Richard Blumenthal, D-Conn., who at the July hearing pushed for Millikin's exit, today welcomed the change. "GM has an opportunity to bring in fresh leadership and sever another tie to the Old GM," he said in a statement. Nick Bunkley and Reuters contributed to this report.